The Diverse World Of Yo-Yo Ma : Deceptive Cadence Sample the musically omnivorous cellist's wide-ranging work — from J.S. Bach to modern invocations of ancient folk traditions. Few musicians possess an appetite for diversity as voracious as Yo-Yo Ma's. The renowned cellist, who turns 60 today, calls himself a "venture culturalist." His collaborations include making music for dancers (including Monday night's collaboration with American Ballet Theatre Principal Dancer Misty Copeland on Stephen Colbert's Late Show), filmmakers, garden designers, architects, Kabuki artists, Muppets and figure skaters. "Music, ultimately, is one of the great ways that we as humans have for coding internal life," Ma said in a PBS documentary. "It's glue that joins people together." Musically, Ma embraces bluegrass, jazz and Brazilian bossa nova, plus a myriad of traditional sounds from across Asia, the Middle East and Europe with his Silk Road Ensemble. Then there's his passion for the core classics. Last month, Ma played all six of J.S. Bach's unaccompanied cello suites in a sold-out performance in London's massive Royal Albert Hall. Today's top composers have written pieces for him. It's all earned him a reputation as his generation's most respected cellist. Ma also happens to be a skilled advocate for the arts. In 2013, he delivered the Nancy Hanks Lecture on Arts and Public Policy in Washington, D.C. The speech, which he titled "Art for Life's Sake," ranged from wonkish statistics to big ideas. "Societies are powered by three engines: politics, economics and culture," Ma said. "A vibrant society exists when all three engines are firing and intersecting, resulting in a populace that is energized, engaged and fulfilled." Yo-Yo Ma was born Oct. 7, 1955 to Chinese parents living in Paris. At age 4, he started learning the cello with his father. After moving to the U.S., one of his earliest public performances, at age 7, was for a gala event that included Presidents Eisenhower and Kennedy and Leonard Bernstein. Later Ma entered Juilliard, where his main teacher was Leonard Rose, and persued a traditional liberal arts education at Harvard, graduating in 1976. Ma's list of awards and achievements is exhaustive: 18 Grammys, the Presidential Medal of Freedom and National Medal of the Arts. He is a Kennedy Center Honoree, United Nations Messenger for Peace and a member of the President's Committee on Arts and the Humanities. Still, despite all the honors, perhaps Yo-Yo Ma's greatest gift is just being himself — with tireless curiosity and a generous spirit. To mark Ma's 60th, we've collected a handful of performances that barely begin to display the depth of this singular artist. J.S. 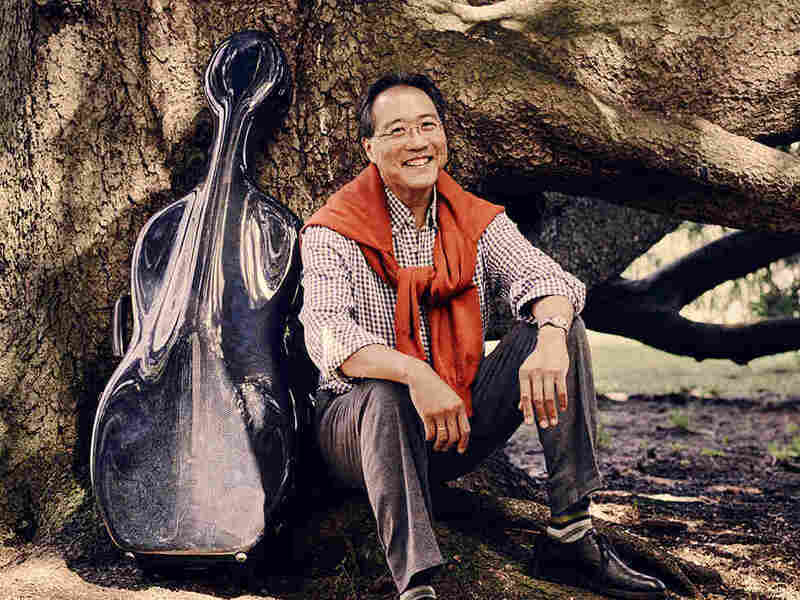 Bach, perhaps more than any composer, has inspired and sustained Yo-Yo Ma. He's recorded Bach's solo cello suites twice, the second time around in collaboration with artists from various disciplines, from filmmaker Atom Egoyan to Olympic champion skaters Torvill and Dean. For Bach's First Cello Suite, Ma teamed up with garden designer Julie Moir Messervy to create a public garden. Each of the six collaborations was filmed and released as the Emmy-winning Inspired by Bach in 1997 and broadcast on PBS. It's no surprise that Ma's insatiable curiosity has inspired today's composers. He's premiered works by John Harbison, Christopher Rouse, Bright Sheng and Tan Dun. In 2006, Ma debuted Azul, a concerto for cello and orchestra and perhaps Osvaldo Golijov's finest work to date. Perfect for Ma's wide-ranging musical appetite, the piece draws on the composer's roots in Argentina and Eastern Europe. In 1998, Ma founded Silkroad, a nonprofit outfit that connects diverse cultures and musicians not only through Ma's Silk Road Ensemble (for which more than 80 pieces have been commissioned), but also by supporting education and cross-cultural business and artistic partnerships. Here, the Ensemble includes members of the string quartet Brooklyn Rider in a performance of Ascending Bird, an arrangement of a traditional Persian melody. Pianist Emanuel Ax has called Ma the best cellist he's ever heard — period. Ma has earned that kind of respect as a generous chamber music partner and by playing the most popular concertos. He's recorded Dvorak's Cello Concerto twice. The earlier version, from the 1980s, shows off Ma's silky, singing tone in the concerto's slow movement. Yo-Yo Ma's musical appetite extends to bluegrass — or we should say newgrass — in collaborations with the masterful bass player Edgar Meyer, mandolin virtuoso Chris Thile and fiddler Stuart Duncan. They were all in high spirits when they appeared in one of our Tiny Desk Concerts to play tunes from their collaborative album The Goat Rodeo Sessions.